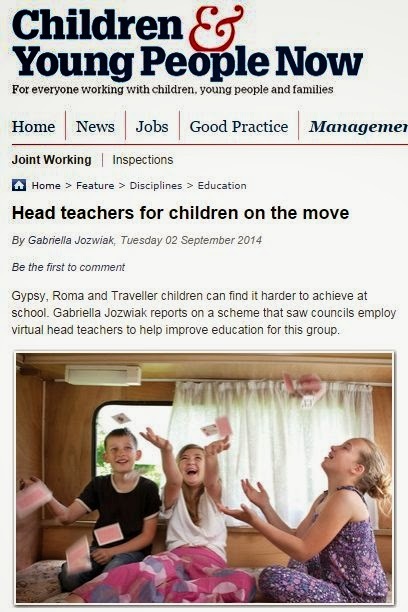 "Gypsy, Roma and Traveller (GRT) children are among the lowest achieving at every level of education. In April 2012, a cross-departmental ministerial working group published 28 commitments to tackling inequalities faced by GRT communities. Six focused on education. Among plans to improve low school attendance and prevent bullying was a Department for Education pilot to appoint virtual head teachers for GRT pupils inspired by the successful virtual school heads model for looked-after children. The pilot set out to raise attainment levels among GRT pupils by addressing common barriers to education including tackling mistrust between parents and teachers created by historic persecution of GRT communities, and engaging parents who may not have completed formal education themselves and be unfamiliar with school systems..."
Read the full article on the CYP Now website.